Whether the property is your main home or a holiday home, contact me and I can arrange your insurance for you. Whether you are looking for a basic cover or would like a fully comprehensive policy. The above all applies to standard build properties - if you have a non standard build I may still be able to assist you but the cover may be different - contact me for further details. Whether it is for a renewal quote or for a new quote, please contact me for all your car insurance requirements. Whether you are looking for life insurance to cover Funeral Costs, Inheritance Taxes, Loans, Mortgages or just to leave a little something, please contact me for a quote. Travel Insurance for Expatriates through Globelink. Please click the picture. Pre-paid Funeral Plans - I can assist you in setting up a pre-paid funeral plans. Instalment options are available and once the premium is paid there are no hidden extras and your funeral will be carried out according to your wishes. Keen golfer - want to ensure you have insurance for your equipment, for you whilst playing and also for that "Hole in One" expense! Liberty Seguros offer a policy especially for you - contact me for more details. 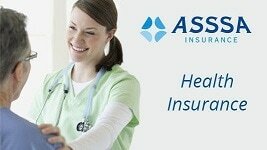 ASSSA is a company with more than 80 years of experience offering quality health insurance especially designed for expats.